Atletico Madrid goalkeeper Jan Oblak has signed a new contract to keep him at the club until 2023. The 26-year-old Slovenia international has kept 115 clean sheets in 203 appearances for Diego Simeone's side since joining from Benfica in 2014. He won the Europa League with the Spanish side in 2018 and helped them to the 2016 Champions League final, where they lost to rivals Real Madrid. 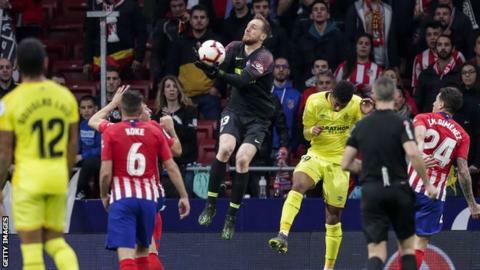 Oblak said he was "very happy" to pledge his future to Atletico. "I will always give my best to defend these colours with everything, I will continue to work hard," he added. Atletico are second in the La Liga table, nine points behind Barcelona, and play Eibar on Saturday.